After seven weeks of AAF football, we bring to you the updated Player of the Year rankings. We have three newcomers on the list this week, cornerback Cody Riggs and interior defender Jerel Worthy of the Orlando Apollos, and edge defender Jayrone Elliot of the San Antonio Commanders. Here is the AAF Player of the Year rankings through Week 7. Cody Riggs makes his first appearance on the top-ten rankings after earning an elite overall grade of 91.1 in the rout over the Legends. Riggs was targeted six times, allowed three catches for only 26 yards and also grabbed an interception in the win. On the season, Riggs has allowed a passer rating of just 43.0, ranking third out of 35 qualifying cornerbacks. Corey Vereen recorded two pressures and one run stop in the comeback win over the Iron, but he earned his lowest single-game grade of the season with a mark of 63.6. Vereen will look to rebound against the Apollos’ explosive offense next week. 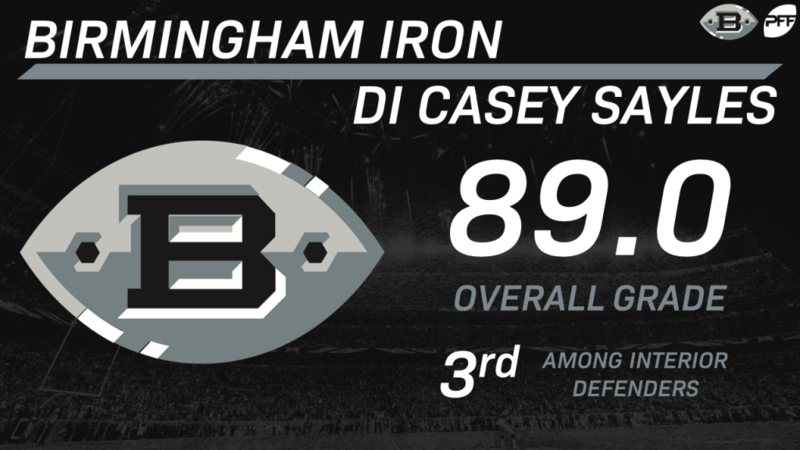 Casey Sayles had a good all-around game in the loss to the Express, earning an overall grade of 71.9 and logging four total pressures and one run stop. With a run-defense grade of 85.8 and a pass-rushing grade of 74.1 this season, Sayles ranks in the top-six in both categories among interior defenders.